An event was held by the Party Organization of Attica of KKE and the Central Council of KNE on November 29th for the International Day of Solidarity with the Palestinian people. The event was a demonstration of the multifaceted solidarity that the ΚΚΕ and ΚΝΕ are manifesting in practice. Banners of solidarity with the struggle of the Palestinian people against imperialism and against the involvement of our country were displayed all around the indoor stadium of SPORTING, where the event was held. “No submission to imperialism, the peoples are the only superpower”, “Immediate recognition of the Palestinian State! Stop the joint military exercises of Greece and Israel”, “Solidarity with the just struggle of the Palestinian people”. During the event, red flags and Palestinian flags were raised in the air under the sound of the slogans “Solidarity with the struggle of the peoples, we say no to the wars of the imperialists’’, “No submission to imperialism, the peoples are the only superpower”, “The imperialists reshape the world, they draw borders with the peoples’ blood”, slogans against the country’s involvement in those plans. The presence of the youth was remarkable. 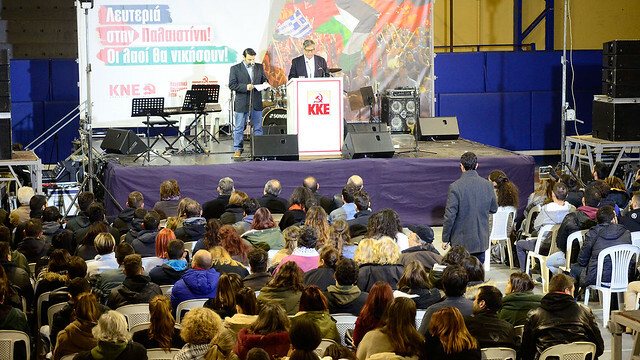 A delegation of the CC of KKE headed by the General Secretary of the CC Dimitris Koutsoumpas attended the event also. The event begun with a greeting speech delivered by the Palestinian Ambassador in Greece Marwan Tubasi and was followed by the main speech delivered by the Secretary of the CC of KNE Nikos Ambatielos. The event ended with a concert by members and friends of KNE who played revolutionary songs and songs of internationalist solidarity, as well of the struggle and the torments of the Palestinian people that were sung in its language. Nikos Ambatielos stressed among others in his speech: “We have always been and always will stand by your side... Because you prove in practice through your struggle that, contrary to the realism of submission the system promotes, there is also the realism of confrontation: there is the road of confrontation, of the irreconcilable struggle against the imperialists and their crimes, through the means the peoples choose each time”. On November 29th, International Day of Solidarity with the Palestinian people, the GS of the CC of KKE Dimitris Koutsoumpas was awarded with the “Friendship Star” Order by the Ambassador of Palestine in Athens, Marouan Toubasi, on behalf of the President of the State of Palestine Mahmoud Abbas, as a gesture of acknowledgment and appreciation of his support and contribution to the promotion of the Palestinian people’s rights. Dimitris Koutsoumpas stressed among others: “We consider it our responsibility and duty to express our constant and incessant solidarity towards our brothers, the Palestinian people, every day, every hour, for all these years, today, tomorrow, until the final solution of the Palestine issue (…) the Greek government, the Greek parliament must essentially and truly recognize the Palestinian State, the Palestinian National Authority, just like other countries have done, and we will continue fighting for that in the coming period. The solution lies in a truly independent sovereign Palestinian State within the 1967 borders, with East Jerusalem as its capital, where the people will be the master of its own land”.